Some of the best voices, young and old, in the county will take the stage at the Franklin Park Arts Center on Saturday. The Old Dominion Chorus, a men’s a capella group, will share the stage with choirs from four of the county’s high schools for a Holiday Singing Extravaganza. The show illustrates a strengthening partnership between the Old Dominion Chorus and the budding vocalists in the county’s school choirs. For the past few years, the a capella Old Dominion Chorus—known for their barbershop quartet-style performances—has held its concerts at the high schools. 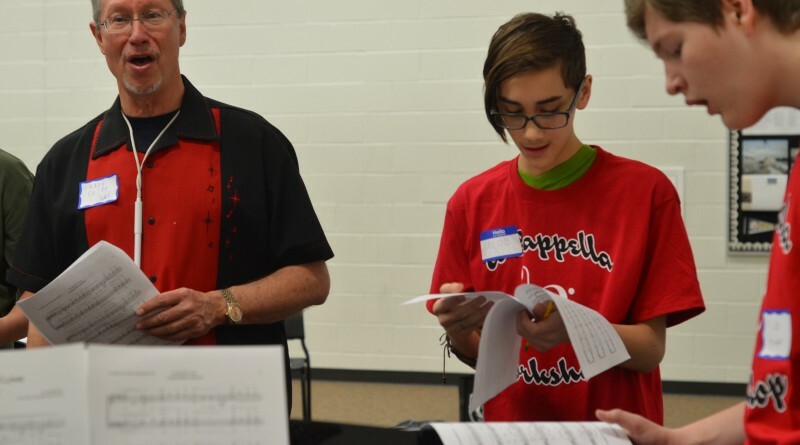 It’s been a “win-win,” said the choir’s president, Tim Peterson, because it’s provided the choir with much-needed performance space and a chance to raise more than $1,500 for the schools’ choral programs. But last December, the Old Dominion Chorus wanted to take the partnership a step further when it invited Loudoun County High School students to join them on stage for a holiday concert at Franklin Park Arts Center. “They were so well received that we said, ‘you know what, next year let’s host the show and provide a showcase for as many of the local high school groups that we can get,” Peterson said. The high school groups on tap are Heritage High School’s T.W.E.L.V.E., Loudoun County High School’s chamber choir, Tuscarora High School’s jazz choir, and the Woodgrove Singers, from Woodgrove High School. Each group will perform two to three songs, then the four high school groups will perform a song together, and, for the final performance, the Old Dominion Chorus and all of the high school singers will take the stage for a halleluiah chorus. Willis Rosenfeld, Loudoun County director of choral, said Old Dominion’s partnership with the schools shows the students that they will have opportunities to continue singing into adulthood, even if they don’t land careers as professional performers. “It’s good for them to see that singing can continue after you get out of high school,” he said. The popularity of a capella groups like Pentatonix have sparked an interest in that style of singing, sans instrumental accompaniment. Peterson said his choral troupe wants to foster that love among young singers. The group is considering hosting a solely a capella concert or contest for Loudoun County students. The Holiday Singing Extravaganza is 4 p.m. Saturday, Dec. 17, at Franklin Park Arts Center, 36441 Blueridge View Lane in Purcellville. Advance general admission tickets are $12; $9 for seniors, students and active military; children younger than 9 are $3. Tickets at the door are $15 for adults; $12 for seniors, students and active military. Purchase tickets at odchorus.org/tickets.